Summer is finally here! With the onset of long, sunny days comes the familiar BBQ smell that we all know and love. 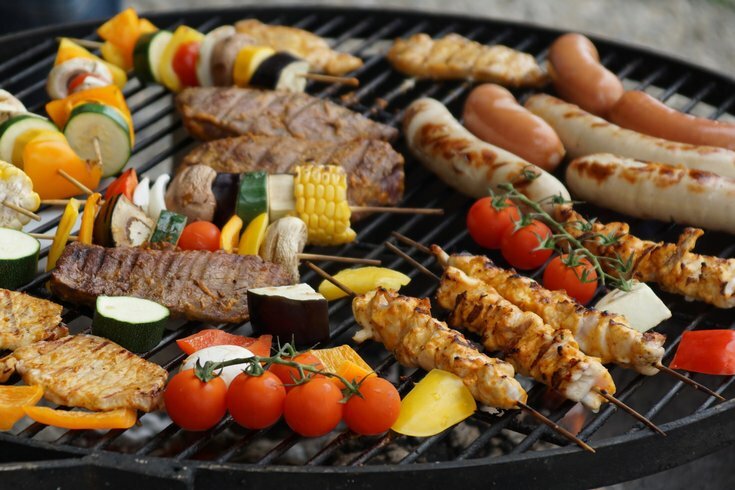 But before you fire up the grill, be sure to familiarize yourself with the potential risks associated with grilling meats at high temperatures. Studies have shown that exposing meats, including certain types of fish, to high heat produces heterocyclic amines (HCAs), which are carcinogenic (cancer-forming) compounds. One of the most effective ways to reduce HCA deposits is to marinate your meat before it’s cooked. Certain ingredients can reduce the formation of HCAs by up to 70 percent. Healthy marinades can be made easily at home using lemon/lime juice, honey, garlic, herbs, spices, and low-sodium soy sauce. Leave the meat soaking in the marinade for two hours in the fridge before you grill it. Meat aficionados looking for a healthier option can marinate using a combination of black pepper (which inhibits HCA production) and other spices such as garlic. You can also combine the HCA-blocking power of black pepper with antioxidant-rich spices (think: rosemary, thyme, oregano, basil, sage, marjoram, cloves, and allspice). Could black pepper and oregano be this summer’s most popular superhero duo? Kabobs are a healthier option during BBQ season because they include healthy veggies like onions, peppers, tomatoes, zucchini, and eggplant. Plus, smaller cuts of meat need less cooking time on the grill: this reduces exposure to carcinogens and, conveniently, the time you have to wait to eat! Polycyclic aromatic hydrocarbons (PAHs), another carcinogenic compound, form when fat drips on the coals and is then transferred back onto the meat via smoke or flames. One way to reduce PAHs is to grill using leaner cuts of meat: they’ll drip less and cause fewer flare-ups and smoke. Chicken, fish, shrimp, and scallops make delicious (and certainly more unique) alternatives to fatty sausages and marbled cuts of beef. By turning down the gas or waiting for charcoal to become low-burning embers, you can reduce HCA formation. Keeping the temperature just below 300° F is ideal. Raising the grilling surface from the coal has a similar effect. Just be sure to use a thermometer to ensure you’re not under-cooking the meat. It’s a little extra work that goes a long way both in terms of health and flavor: residue builds up over time and so do carcinogens. Expert grillers also know that a clean grill makes your food taste better. Incorporating one or more of these approaches will guarantee a healthier (but equally tasty) BBQ experience for you this summer. Who knows: you may actually prefer a chicken and pineapple kabob to a fatty hamburger.